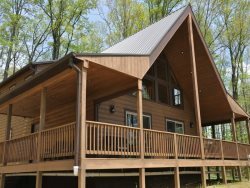 Deer Run Cabin has 4 Bedrooms & 3 Baths. 3 King beds, 4th room has a 2 twin beds. Master bathroom has a corner garden tub. Experience the comfort of wandering thru a lush green meadow near the top of one of the Great Smoky Mountains. This cabin has all the amenities you look for in a great cabin in the mountains including a hot tub overlooking an impressive mountain view. Situated on two plus acres of ‘flat ground” which is rimmed by giant poplar trees that create a truly unique feeling of ease and relaxation. Gather family and friends for a game of football, whiffle ball, horseshoes or any yard games that require expansive green space. Many species of animals also love to gather on the lush greenery including White Tail Deer, Wild Turkey and a treasure trove of colorful birds. A peaceful and private experience. Maximum capacity of up to 8 is based on county guidelines. Thank you for sharing your cabin with us. It is beautiful and we had a great time! Hated to leave. Such a beautiful place, wish i lived here. Our family had a great time here! Lots of awesome memories were made and fun had by all! The Cherokee Casino was a short 20 minute drive and very nice. Bryson City was quaint. We loved your cabin! One of the nicest cabins we have stayed in Would love to come back in the fall! My boyfriend booked this place as a surprise getaway for my birthday. I was definitely surprised. This cabin is beautiful, clean and spacious. Loved the view, hot tub, and master bedroom. Would definitely come back! This was a good get away for two families to enjoy. Very welcoming and relaxing. You gave this family the ability to reconnect on a level you will never understand and I am not able to say thank you enough!!! We loved this cabin! We almost felt spoiled with all of the room! The basement kid kave was awesome. The yard was huge and we enjoyed catching fireflies and playing Frisbee. There were also many Turkeys to look at. Amazing stay! We had an amazing time! WOW! The was amazing with wonderful views and a great big yard! LOVE! Beautiful setting and we loved the cabin, especially the Hot Tub. he cabin was great, the team at GSCR was excellent. We celebrated my birthday. Amazing!! So appreciative that our fur babies could come here. Thanks so much!! We will return ALOT!! Housekeeping did a fantastic job! The cabin is absolutely gorgeous!! Amazing view and loved how the porch was gated so that our pooch could come outside freely!! Will definitely return. The cabin was secluded and quiet, very clean and well maintained. We loved the hot tub. Had the pleasure of staying in this newly acquired cabin. Very spacious. Loved the outdoor area, nice and flat for the kids and dogs to run and play. We enjoyed the Hot Tub and looking out at the stars. Cabin was very clean and well appointed. We will definitely be back in the fall to see the leaves.